Minister for Jobs, Enterprise and Innovation, Mary Mitchell O’Connor TD, today announced that GE (NYSE:GE) is to invest €150 million in a new biopharmaceutical manufacturing campus on Industrial Development Agency (IDA) Ireland’s strategic site at Loughbeg, Ringaskiddy, Co. Cork. GE BioPark Cork, subject to contract and planning approvals, will feature Europe’s first KUBio™, prefabricated, off-the-shelf bio-manufacturing facilities, owned and run by GE customers, and will serve as focal point for further investment in next-generation biopharmaceutical manufacturing in Ireland. GE BioPark Cork is expected to be home to more than 500 new jobs when fully operational; 400 with biopharma companies and a further 100 employed directly by GE. The construction phase, subject to planning approvals, is expected to begin by mid- 2017 and create up to 800 construction jobs. The project is supported by the Department of Jobs, Enterprise and Innovation through IDA Ireland. To further develop biopharma manufacturing skills and expertise in Ireland, GE and the National Institute for Bioprocessing Research and Training (NIBRT) also announced today their plan to create a NIBRT-GE Single-use Centre of Excellence at NIBRT’s Dublin facility. NIBRT expects to train up to 1,500 bioprocessing professionals annually on next-generation biologic manufacturing technologies. These exceptional technologies for biopharma manufacturing will be used in GE BioPark Cork’s manufacturing facilities. 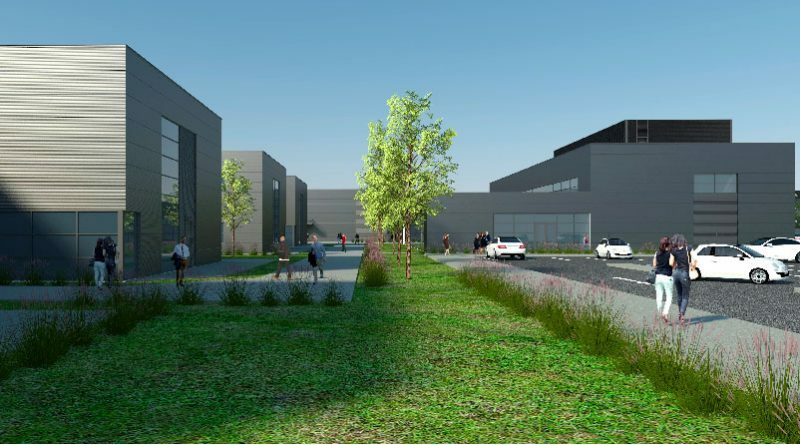 GE BioPark Cork will be a GE-managed campus including four fully-equipped KUBio factories owned by independent biopharma companies manufacturing proprietary medicines, with GE running centralised shared utilities and site services. Patient demand for innovative medicines is driving rapid global growth of the biopharmaceutical industry, resulting in significant need for more production capacity. GE’s KUBio enables pharmaceutical companies to quickly deploy new biologics manufacturing capacity and bring medicines to market faster. KUBios increase manufacturing flexibility and are between 25 and 50 percent more cost-effective to build than comparable traditional facilities. Carbon dioxide emissions can be reduced by 75 percent and water and energy use by approximately 80 percent. Build time can be shortened to 18 months from the usual 3 years.